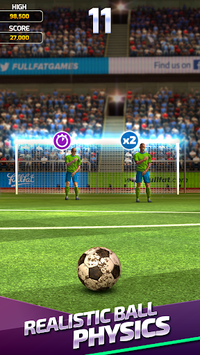 A must-have football game for soccer and free kick fans alike! Simple and addictive gameplay, stunning graphics, five amazing modes and arcade style target practice. 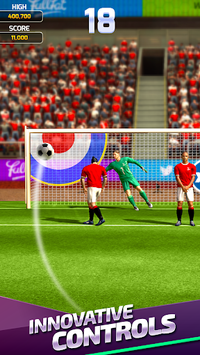 Put your free kick and football skills to test! You don’t need to pay to unlock anything, just download for free any play! New design, new players and pitches, different times of day, weather conditions including rain and snow, new classic and pro footballs, even more player kits and animations. 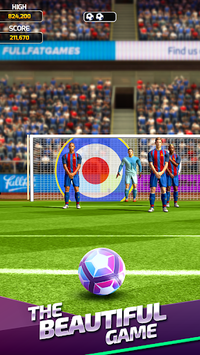 Hit the target to score points and the bonus targets for rewards. Unlimited fun! How long can you survive? Score as many points as you can! Hit the bullseye for extra time. The longer you last, the harder it gets. Shoot for gold! Only perfect shots will do, so make each one count. Avoid defenders and goalkeepers! Smash the glass panels! Clear all five levels as fast as you can for higher scores. * Improved and fast gameplay for mobile devices! * Realistic ball movement, improved 3D graphics, animations, physics and superior controls! * Play soccer offline with no internet connection or WiFi!